By Allan Fox: Maciej Sulecki (28-1, 11 KOs) will be challenging WBO middleweight champion Demetrius Andrade (27-0, 17 KOs) after all on June 22 or 29, according to promote Eddie Hearn. He had previously ruled out Sulecki, 29, as an opponent for the Matchroom fighter Andrade after he suffered a hand injury in his 10 round unanimous decision win over Gabriel Rosado on March 15. Hearn says Sulecki’s team has cleared him to fight against Andrade, according to IFLTV. This is a good fight. Sulecki came close to being Daniel Jacobs last year in April in losing a 12 round unanimous decision. Jacobs pulled out the victory by dropping Sulecki in the 12th round. However, the other rounds were very close with Sulecki appearing to at least half of them with his accurate punching. Jacobs came through in the 12th round when Sulecki got sloppy, and put himself in harms way for one of his right hands. Sulecki looked both good and bad against Rosado. 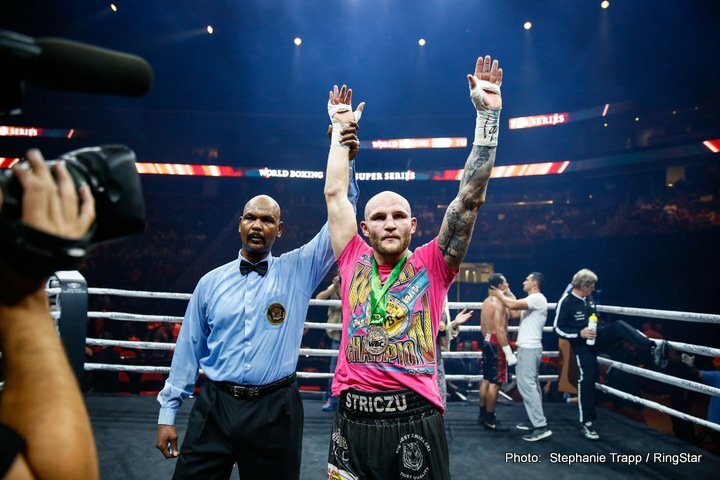 Through the first eight rounds, Sulecki was dominating the fight in an embarrassing fashion, making the 34-year-old Rosado look like an old man inside the ring. The fight turned around in the ninth round when Rosado dropped Sulecki twice. The second knockdown was from repeated punches to the back of the head by Rosado. The referee was just standing by and failed to step in and stop the rabbit punches. Surprisingly, the knockdown was considered legit, but in slow motion one could see that Rosado hit Sulecki with four consecutive punches to the back of the head while trying to knock him out in the round. Sulecki held his own in the 10th, and was able to get the victory. Earlier in the fight, Sulecki had dropped Rosado in rounds 1 and 8 with right hands. With WBA/WBC middleweight champion Saul Canelo Alvarez saying this week that Gennady Golovkin needs to win a world title in order to get a fight against him in September, it leaves open the possibility that the Kazakh could look to face Andrade for his WBO middleweight title in his next fight on June 8. If Golovkin believes that Canelo is just bluffing about saying that he needs a world title in order for him to face him in September, then he’ll go ahead and ignore what he’s saying and not face Andrade in June. The two fighters that Golovkin’s management have reportedly made offers to are Steve Rolls and Hassan N’Dam. Those are both ranked contenders, but not viewed as tough outs for GGG, who looks like he’s making sure he doesn’t have any slip ups in his next fight. Andrade vs. Golovkin would be a big fight in June if it were to happen. But if not GGG, then Sulecki is a good option for Andrade’s next fight on June 22nd/29th in Providence, Rhode Island.